This year I had a shot at the race as an individual. I have run a few half marathons. I started running six months ago and have knocked off three half marathons since then with a personal best of one hour forty eight minutes. So my fitness was a lot better than in previous years. At the beginning of the 10km run, there is a sand dune. I sprinted up a bit too quick, ran out of energy and started to get cramp. I was then forced to walk a few kilometers. After the first drink station, I was back in shape and finished the running stage with a time of 53.35. This was a bit disappointing. With the help of my excellent support crew I quickly changed from my running mode to my cycling mode. The road bike was the easiest stage for me. The road works at Punganui Bridge were an obstacle. There were traffic marshals and I arrived on the end of a tail. I was told to stop, but not wanting to waste any precious minutes waiting for the light to turn green again, I sprinted up and met up with the group on the other side of the bridge, leaving some pretty annoyed cyclists behind me as I sailed over the hill. The mountain bike was my slowest stage even though I’ve done it a hundred times in practice and twice previously in the actual race. I was going well until the very last hill, the dreaded Noakes Hill climb. I was greeted by a very sweet fellow competitor congratulating me in my efforts and feeling slightly cocky I went to change quickly into my highest sprocket for the decent and the chain jumped off, leaving me looking rather silly as I stood my bike upside down to fix it. This wasted a few precious minutes. The kayak transition was a rather leisurely affair, coated in sunscreen by my grandma and fed by my Dad, and putting about 2kg of mud in the bottom of my Kayak or “plastic barge” as my dad calls it. I was feeling quite lethargic; I sat in the boat and let the tide take me with it. The kayak for me was quite relaxing; it was really quiet and peaceful, until I was overtaken by some fit person in a 12kg multisport kayak. I just paddled away, not worrying too much about my time and just relaxing and just making sure I was moving. That’s why I was so fresh and cheerful at the finish. 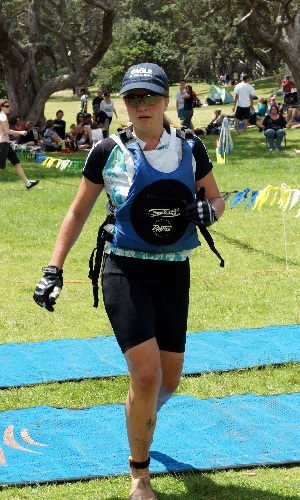 When I did eventually make it to the finish, I completely forgot about running. I was standing looking around with all my supporters yelling at me to run. I was a bit wobbly but I ran to the line and over the mat. My final time was 4:36:26 so I have something to work on for next year. This is such a cool event to do; I will be doing it a few times yet, quite a social event. Gets everyone talking and off the couch. It’s quite fun, not huge long distances so it suits all ages and abilities. Race your mates, have competitions against your colleagues and bring in a few laughs and inside jokes.